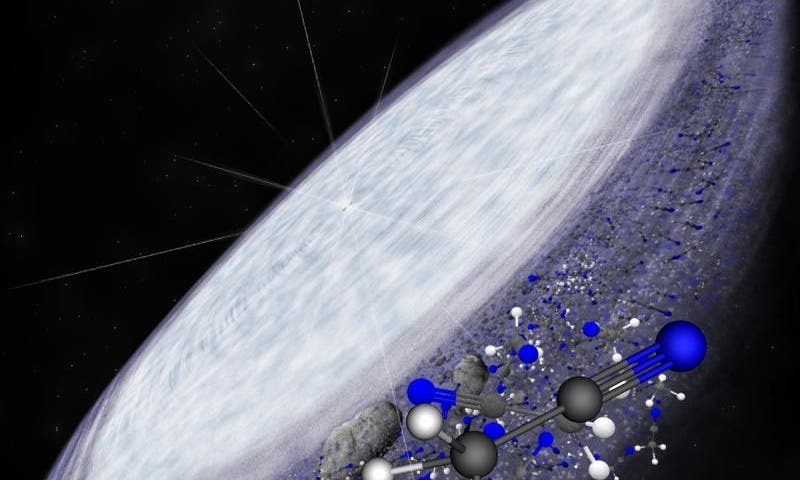 For the first time, astronomers have detected the presence of complex organic molecules, the building blocks of life, in a protoplanetary disc surrounding a young star. The discovery, made with the Atacama Large Millimeter/submillimeter Array (ALMA), reaffirms that the conditions that spawned the Earth and Sun are not unique in the Universe. The new ALMA observations reveal that the protoplanetary disc surrounding the young star MWC 480 contains large amounts of methyl cyanide (CH3CN), a complex carbon-based molecule. There is enough methyl cyanide around MWC 480 to fill all of Earth’s oceans. This star is only about one million years old. By comparison the Sun is more than four billion years old. The name MWC 480 refers to the Mount Wilson Catalog of B and A stars with bright hydrogen lines in their spectra. By exploiting ALMA’s remarkable sensitivity astronomers can see from the latest observations that these molecules not only survive, but flourish. ALMA is able to detect the faint millimetre-wavelength radiation that is naturally emitted by molecules in space. For these most recent observations, the astronomers used only a portion of ALMA’s 66 antennas when the telescope was in its lower-resolution configuration. Further studies of this and other protoplanetary discs with ALMA’s full capabilities will reveal additional details about the chemical and structural evolution of stars and planets. Importantly, the molecules ALMA detected are much more abundant than would be found in interstellar clouds. This tells astronomers that protoplanetary discs are very efficient at forming complex organic molecules and that they are able to form them on relatively short timescales. This rapid formation is essential to outpace the forces that would otherwise break the molecules apart. Also, these molecules were detected in a relatively serene part of the disc, roughly 4.5 to 15 billion kilometres from the central star. Though very distant by Solar System standards, in MWC 480’s scaled-up dimensions, this would be squarely in the comet-forming zone. The results are published in the 9 April 2015 issue of the journal Nature.